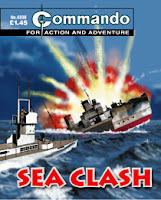 Amidst all the excitement surrounding the re-launch of The Dandy, another new comic has slipped almost unnoticed onto the shelves of British newsagents. 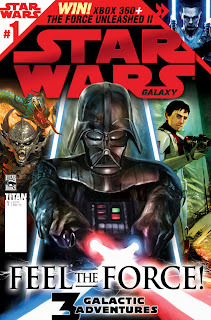 Star Wars Galaxy is a new 4-weekly title from Titan, published in the same format as their Batman/DC inspired titles. 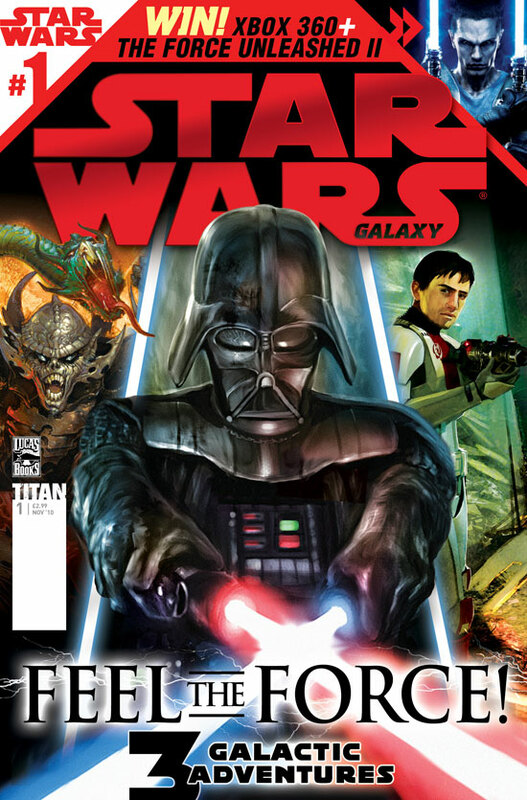 The first issue, with an eye-catching Darth Vader cover, features three stories that all take place at different points in the Star Wars timeline. Purge: The Hidden Blade features a post-Revenge of the Sith Darth Vader trying hard to keep the Emporer happy and not entire succeeding. In Invasion: Refugees, Luke Skywalker, Han Solo and Leia Organa Solo fight off a new evil enemy. And The Old Republic: Threat of Peace takes place thousands of years before Luke Skywalker was born when the Sith were at their peak. There's also a chance to win an Xbox 360 and a copy of The Force Unleashed II game. For me this title really does fill a gap in the market and it's one I've been hoping to see from Titan for a long time. I'm a big Star Wars fan but I don't really want the in-depth analysis of Star Wars Insider. The Star Wars: Clone Wars comic on the other hand is aimed at much younger readers with its larger page size and seemingly-endless flood of free gifts. This is a title older comics fans should be able to buy without feeling embarrassed at the checkout! And I really do feel that Star Wars (like Spiderman) is a big enough franchise to support three regular titles. I would love to see Titan do a similar thing for Transformers which has a lot of older fans who read the Marvel UK comic in the 1980s. And I also think it's time Panini did a Doctor Who comic (just comic strip, no features) in the same format as its Classic Edition titles such as Astonishing Spiderman etc. Doctor Who's popularity is as high as it's ever going to be so I think now is the time. True, the IDW titles fill this gap in the market to an extent but they are only available in comic shops and not newsagents. I'd like to see something similar to the old Doctor Who Classic Comics title with a new Matt Smith strip backed up by reprints of classic material. The Star Wars Galaxy title seemed to be selling well when I popped into WH Smith yesterday with only 2 copies left on the shelves. British comics truely are in a better state than they were ten years ago, thanks to Titan and the other publishers. With Strip Magazine on its way, things are looking up! The winners of the Eagle Awards have been announced at a gala presentation held at London ’s ExCeL on Friday, October 29 2010. Superhero titles again dominated most of the favourite titles and 2000AD topping the boll for favourite British book, but there are some welcome newcomers in the list of deserving creators who have won awards this year. The organisers say this year's poll of fans across the globe was also another record-breaking year for the awards with a continued growth in the number of participating voters (although they don't say exactly how many people voted). Apart from Britain , the USA and Canada, the thousands of ballots that flooded in came from more than 100 countries including several from Europe as well as Afghanistan, Botswana, Egypt, India, North Korea, Russia, Thailand, Uruguay, Vietnam and Zimbabwe - to name but a few. Currently writing titles such as Fantastic Four. "So I won an Eagle Award, but they spelled my name wrong," he noted on Twitter. "It's supposed to read: K-I-E-R-O-N G-I-L-L-E-N."
Best known for his work on Phonogram: Rule Britannia, co-created with writer Kieron Gillen. He also created Suburban Glamour, a four issue mini-series from Image Comics. "it's all fancy and glass, apparently," he said on Twitter. "I hope Kieron hasn't broken it. :()"
"My phone is going nuts with claims that I won the Favourite Writer award at the Eagles, too," says Warren on Twitter, after telling other creators they won awards. "This is clearly an error." Later, he noted on his web site: "I’ve already won one of those, and also my name isn’t Alan Moore or Geoff Johns. I calmly await the inevitable retraction." Best known for his work on the comic books Catwoman, The New Frontier, The Spirit and Richard Stark's Parker: The Hunter. 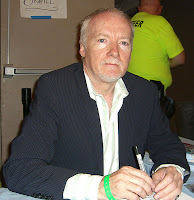 Best known for his frequent collaborations with Grant Morrison on titles such as New X-Men, WE3, All Star Superman, and Batman and Robin, as well as his work with Mark Millar on The Authority. Best known as the co-creator of 2000AD's Nemesis the Warlock, Marshal Law (with writer Pat Mills), and The League of Extraordinary Gentlemen (with Alan Moore). Best known for his work on titles such as Chase, Promethea and Desolation Jones. Art credits in include Fell (with writer Warren Elis), co-creator of 30 Days of Night (with Steve Niles), Dead Space, Doctor Who - The Whispering Gallery and Groom Lake. Best British Black & White Comic Book: Whatever Happened To The World's Fastest Man? Congratuations to all the team at Accent. 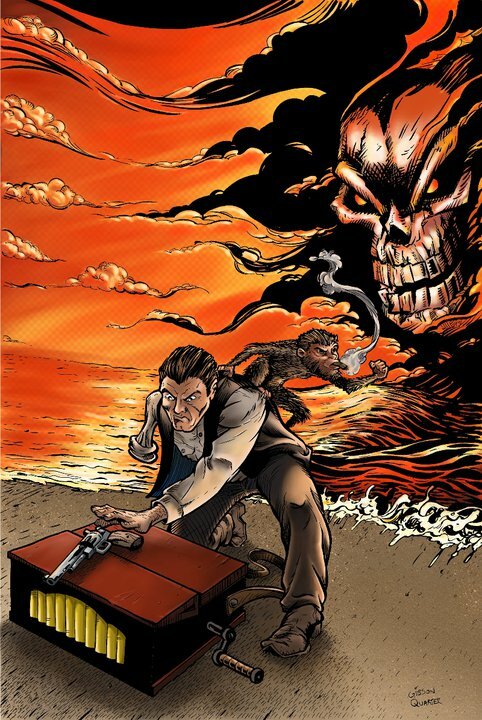 Published by Image Comic, created by writer Robert Kirkman and artist Tony Moore, now drawn by Charlie Adlard. "I have told the relevant people to give the physical award — which, sadly, is still not a large bird of prey — to Paul," says Warren, "because he’s certainly earned having a large metal thing standing in his house leering at him the recognition." Introduced in 1976, the Eagles are the comics industry’s longest established awards. Acknowledged as the pre-eminent international prizes, they have been featured on the covers of leading US and UK titles across the last 32 years ranging from Uncanny X-Men and Swamp Thing to MAD and 2000AD. Unique in the comics industry in that they reflect both the professional and the reader’s choice, the Eagle Awards comprise of two distinct stages: a Nominations Form allows the entire comics community to choose their favourites; then the top five nominations then appear on the voting form for the readers and fans to choose from, thus focusing the fans with no wasted votes. Wasted #6 heading for stores... mind your heads! 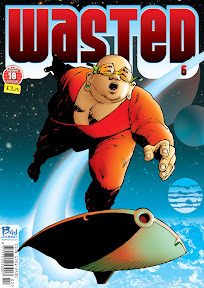 The latest issue of adult comic Wasted (#6) has gone to press, with a cover by Cam Kennedy featuring Jon Haward and Alan Grant's Buddha. (Jon by the way, was recently interviewed here on the title's blog). The new issue features, amongst other random things, these recurring strips - War On Drugs, Tales Of The Buddha, Lusi Sulfura, Total Fear, S*** The Dog, Junkie Dad, Amber Nectar and RamRod. 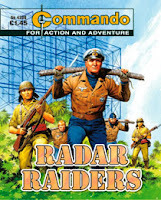 Contributors this issue are: Alan Grant, Cam Kennedy, Carlos Ezquerra, Johnny Horney, Dave Alexander, Russ McPherson, Liam Bryant, Craig Collins, Simon Bisley, Jon Haward, Rob Baker, Garry McLaughlin, Nick Very, Gibson Quarter, Ray Manta, John Miller, Robert Smith, Lex, Jamie McMorrow, Adam Smith, Claire Deakin, Jacek Zabawa, John Wagner, Martin Smith, Alan Kerr, James Corcoran, Paul McCann, Kent Taylor, Jules Boyle (ahem, apologies...), Jamie Grant, Jim Devlin and Pudsy (rest in peace). Comics guru Brendan McCarthy says: "Wasted is the best new comic since Deadline!" And, Bad Press assure us, Brendan has never been known to be wrong! Gibson Quarter is best known for his illustration work on War on Drugs strips with writer Alan Grant, for the adult comics magazine Wasted which will soon see a sixth issue on sale. 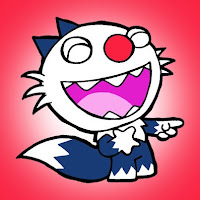 He's also drawn stories for numerous other magazines and comics including Northern Lightz, FutureQuake, Something Wicked, Zarjaz and Dogbreath abd contributes to the webcomic, Fractal Friction. 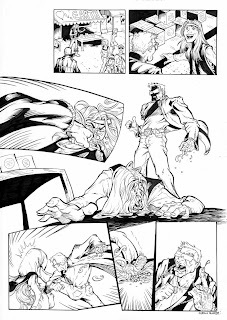 In North America, he's provided art for Holmes Inc with Ty Templeton, and the upcoming 7th Wave #1. What tools do you mainly use to create your art? Gibson Quarter: Pencils, pencils and more pencils! When I have to ink, I use crow quills, (hunt 102 almost exclusively) brushes, and India ink. Gibson: Time’s relentless march forward inspired me. I’ve always loved art, and could draw pretty well in my younger days. After not drawing for 10 years, (but still always reading comics, graphic novels and art books) I decided that if I don't get some of my art out into the world, I’ll really regret it when I’m older. So I got focused, and got going! What was the most useful piece of advice you were given when you began learning your craft? Which artists most inspire you? 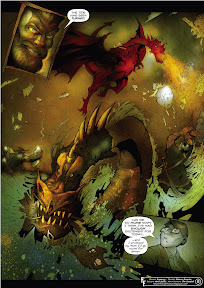 Gibson: Arthur Adams, Frank Quitely, Joe Madureira, Chris Sanders, and many many others. I find a new favorite artist every day on Deviant art! What is the appeal to you of science fiction as an inspiration for some of your work? Gibson: Science Fiction is limited only by one’s creativity. None of the environments /people/creatures exist yet, so you can go crazy! It’s very freeing, and fun to draw. Gibson: My answer to this is usually always, ‘my latest creation.’ I try very hard to constantly improve my art. 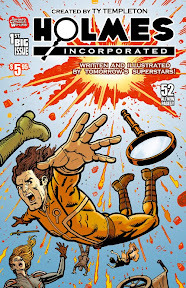 That said, I’m always proud of my War on Drugs art for Wasted magazine, especially when Gary Erskine inks my pencils. In your career, have you had any bizarre experiences while creating your art? Gibson: Nothing too crazy, but I do have a constant and ongoing battle with my cat, as he often tries to get up on my drawing table… it terrifies me when I’m inking pages! What most frustrates you about being an artist? Gibson: My speed. I always want to be faster and produce more, but it’s not always possible. What keeps you going despite the hopefully occasional frustrations? Gibson: Positive fan feedback on my work. It’s like manna from heaven! What advice would you offer to anyone starting out as an artist? Gibson: Don’t rush your art, and learn Photoshop... It can really help out in the early stages of creating good art. The new Dandy: Who Did What, then? Following up on yesterday's post about the new Dandy, editor Craig Graham has kindly taken time out of his busy schedule to give fans a run down of the creative team behind the brilliant revamp revealed in Issue 3508, which sees Harry Hill now fronting the back-to-weekly frequency comic along with a cover price drop to £1.50. • Nigel Parkinson is drawing Harry Hill, The Phantom Pharter, Little Simon and chief Harry-knowing comics nut.He began working in comics back in 1980, and started working on The Dandy in 1982 and The Beano in 1997, on strips such as Bea and Ivy the Terrible. He's also occasionally drawn The Bash Street Kids. "His contribution has been incalculable - and should be applauded to the hills," says Craig. • Jamie Smart draws Desperate Dan, Pre-Skool Prime Minister, and created the new comic's the Style Guide. "Jamie's been a part of The Dandy for six years now, and when we came to set up the style guide, Jamie's name was first on our list. He was also author of a remarkable email to me which coincided, in emotion and timing, with the initial proposal for these changes." • Wayne Thompson draws The Mighty Bork, Pepperoni Pig, Shao Lin Punks, Bananaman and Noel or No Noel -- "a remarkable artist and friend." Wayne also drew Billy Whizz for The Beano (now drawn by Nick Brennan). Wayne had been drawing Agent Dog 2-Zero for Dandy Xtreme as well as Jak. • Lew Stringer draws Postman Prat and Kid Cops. "Lew's a long-time champion of comics, artist and one of the first names on the list of new artists we hoped to get on board," notes Craig. downthetubes fans will know him for his work on TOXIC and as creator of Combat Colin for Marvel UK. • Nigel Auchterlounie draws The Bogies (which were created by Mark Greenbaum and Paul Kell) and Professor Dandy. "He's a great writer, artist and ideas man. Look out for much much more from Nigel in The Dandy. He's also an early morning Sky TV superstar!" • Duncan Scott draws Simples! 101 Ways to Use a Meerkat, Count Snotula and What's In Cheryl's Hair Today?. "There really will be 101 Meerkat episodes!" Craig assures us, "but not so many of Cheryl's Hair. He's a top guy and great artist." 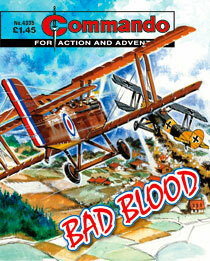 Duncan has also worked for Hallmark Cards and The Beano (drawing strips such as The Neds) and TV Times. • Chris McGhie draws iDad. "Chris is very busy with things far more important than comics, but he always finds the time to help us out," says Craig. He previously drew Bananaman for the comic. • Alexander Matthews draws Robot on the Run. "Alexander is well-known in more grown-up cartooning circles, but new, I believe, to kids' comics," Craig reveals. Robot on the Run is, in fact, a serial, and it's a good 'un!" Alexander has drawn cartoons for The Guardian, Private Eye and many more magazines. • Andy Fanton draws George vs. Dragon. "Andy's a friend of Jamie's, recommended by him, and one of the first new artists we found for The Dandy. He's doing more stuff as we speak. • Phil Corbett draws longtime Dandy favourite Korky the Cat, who Craig admits wasn't coming back until Phil and staff artist Chris combined their energies to fight his corner. "It turns out it was good enough to make the cover, so what do I know?!" "Drawing Korky means a lot to me as I grew up on comics," says Phil in a blog post. "Korky was always one of my favourites and who would ever have thought I would get to be working with him. "It's a real treat to be bringing back a character with such a history after his couple of years off - I believe he was away travelling - and hats of to the Dandy people for letting me change him so much." • Garry Davies draws TV Teaser. "Gary's a great guy. It's a simple idea and kids love it. What more do you want?" Behind the scenes, Craig also gives a tip off the hat to Dandy office staff Michelle, Ally, Katy, Mark and Chris. "Their efforts have been unstinting," he enthuses, "even when putting together Dandy Xtreme and working on this project." Initial reaction to the revamp is very positive, Criag revealed over on ComicsUK yesterday. "A lot of research, experience and plain hard work has gone into it since we kicked the project off," he says, "and its success as a comic is all down to its contributors, whether freelance or DCT-employed." (Updated 27/10/10) The Dandy - the real, comic strip driven Dandy - is back this week with a vengeance, ditching the magazine-style, TOXIC-inspired magazine format of Dandy Xtreme in favour of a weekly title with a £1.50 cover price. 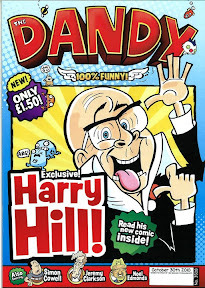 As well as a price drop, the new, 32-page comic, which has also dropped cover mounted gifts, aims straight for the jugular by spoofing popular culture, with material from comedian Harry Hill (who now fronts the comic), a celebrity who is perfect match for the look of the new Dandy. He'll appear alongside old favourites such as Desperate Dan and Korky the Cat, plus new strips from cartoonists such as Nigel Parkinson (who draws Harry Hill), Andy Fanton and Lew Stringer. "it's almost entirely comic strips," enthuses Nigel Parkinson of the new-look Dandy on his blog, which he also says will be heavily promoted – and publisher DC Thomson's use of social media such as Facebook and Twitter is just the start of that. "The strips are mostly brand-new. There are pages by people new to the Dandy and by people new to comics." The new strips include Pepperoni Pig, Clive 5, Bill Oddie-Watch, The ZZZ-Team, The Y-Factor and Bear Thrills. Another major change for the title will see readers be given more control, allowing them to vote on The Dandy website to decide which characters stay and while will go to make way for new characters. "The Dandy was the first comic I read as a child," says Lew Stringer of his involvement. "It helped teach me to read, so I'm very pleased and honoured to have been asked to contribute." He's revealed he's drawing two of the strips: Kid Cops and Postman Prat, both created inhouse, with scripts on Postman Prat from Dandy editor Craig Graham and Ally Bernard. (Lew is writing and drawing Kid Cops). Andy Fanton is to contribute George vs Dragon, which reworks the Saint George and the Dragon tale as a slapstick, Wile E. Coyote-esque farce. "I’m thrilled to get the opportunity to work for the comic, as not only is it a very well-known and prestigious title, but it’s also one of the (many) comics I read loads when growing up," he says. "... to be one of the guys now doing the comics is pretty much a dream come true, and I feel very lucky indeed. And excited. And nervous." While some may scorn the use of celebrities to help push sales, DC Thomson are well aware how media-savvy their target audience is, and say the celebrity input is to make it more topical! "So far we’ve immortalised Cheryl Cole, Noel Edmonds, Jeremy Clarkson and we’ve even added the ultimate X-factor, Simon Cowell…," one of the team notes on their Facebook page. "You never know who’ll be next!" “The Dandy has constantly evolved over its 73-year history, but the brand new Dandy is the best and funniest it’s ever been," claims Craig Graham, editor-in-chief. "We’re providing something quite different to our competitors in terms of content, format and price-point that’s based on the unique Dandy heritage, exceptional British cartooning talent and that’s all backed up by compelling reader insight and market research. “The icing on the cake is having Harry Hill join the team. With a renewed focus on comedy characters, it’s a real thrill to be working with one of the nation’s favourite family comedians. As he writes the strip himself, I’m not always exactly sure what’s going to be appearing each week so I’m as eager as everyone else to find out. First published on 4th December 1937, The Dandy is the world's longest continuously published comic and holds the record for the largest sale ever of a comic in UK history - May 1950 saw over 2 million copies of The Dandy sold. While these days it's unlikely any British comic will ever reach that level of sale, the new look is a welcome revamp for a title some have feared was on its last legs and shows just how much faith DC Thomson has in its popular characters. We wish everyone involved the very best of luck with this new direction. The first issue of the new look weekly Dandy is officially on sale on Wednesday 27th October 2010 and will cost £1.50. Ever since one fateful day during the First World War there had been bad blood... very bad blood... between the people of the small French village and the Germans. One German family in particular — and for very good reasons. 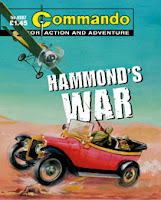 (Unusually for an issue with a Gordon Livingstone cover, he did not supply the inside artwork to this DC Thomson title). Germany and Japan were supposed to be allies, fighting on the same side — but the Japanese suspected these German sailors of spying. Obviously it was a ridiculous idea... or was it? 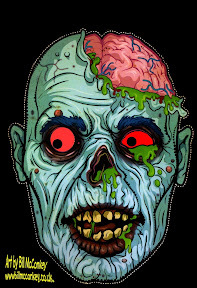 Comical Hallowe'en Horror walks the streets of Lancaster! Lancaster's First Age Comics is making its annual Hallowe'en celebrations something of an event, offering prizes to anyone who turns up in costume to buy their favourite comics this weekend. Whatever you're after, the First Age Comics Hallowe'en Bash starts at 10.00am this Saturday 30th October and you're all invited! The annual celebrations - which were a huge success for the comic store last year - will run all the way through to 5.30pm, offering free comics, free candy and ghoulish goodies for those who turn up in costume. "The dead may rise, but it's OK," says shop owner Mark Braithwaite. "They love comics too!" 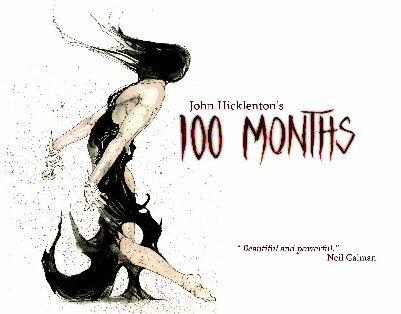 100 Months, the final work of the late, great 2000AD artist John Hicklenton is now available from publisher Cutting Edge Press. Pat Mills describes it as "magnificent" and hints that despite John's passing earlier this year there is more work yet to be seen. 100 Months is John Hicklenton's final graphic novel, a parable of environmental devastation in which Mara, Warrior and Earth Goddess, seeks revenge against the Longpig: a satanic personification of capitalism, red in tooth and claw, whose followers, a legion of the damned, look quite a lot like... us. John is best known for his work on 2000AD, Nemesis the Warlock and Heavy Metal Dredd was one of Britain’s leading comic book artists, famous for the brutal, visceral draughtsmanship he brought to the 2000 AD/Judge Dredd titles, transforming their cartoon dystopia into a circle of hell. His artwork was and remains uniquely disturbing and powerful, and often too much so for some comic book fans, and his career was dogged by requests that he 'tone it down'. In writing and drawing 100 Months, John faced no such censorship, and gave free reign to a vision that is both starkly beautiful and apocalyptic. The world of the Longpig is rich in killing fields and scenes of mass crucifixion recalling Goya at his darkest. The title, taken from HRH Prince Charles's warning that there were 100 months remaining to prevent cataclysmic climate change, reflects the urgency of both the book's prophetic voice, and the spirit and circumstances in which it was written. "I was lucky enough to have Johnny Hicklenton draw my first published story, and I knew from the start that his was a unique and powerful vision," says Neil Gaiman. "100 Months is a heartbreaking final vision: one man going head to head with death, and with Death, and with life. I felt lucky to be allowed to read it and fortunate that Johnny made it for us before he left. It lingers and it haunts, and, ultimately, affirms." John took his own life with the assistance of Dignitas in Zurich on the 19th March 2010, following a heroic struggle with Primary Progressive Multiple Sclerosis (His life, work and illness are the subject of the Animal Monday documentary Here's Johnny, which was broadcast on More4 and was the first film in history to win two Grierson awards). 100 Months was drawn and written in foreknowledge of his own imminent death, and its quality of intimate insight into universal themes of life, death and the planet's own survival seems at times to come from a place between worlds, to have been transmitted from the Hades, Western Lands or Sheol of the ancients to the 21st century as a cry of warning. Despite Johns death, in a recent Facebook post, Pat Mills praises 100 Months, calling it "magnificent", and also hints that John left a lot of other unpublished work, including "artwork for a book with the title Bedlam," which he would love to see in print, too.